As title. Some shocking pictures coming out of France. The spire has collapsed and it looks bad. Absolutely dreadful news. Possibly the finest gothic building in the world. Went to the top of one of the towers back in November and there is nowhere like it. Took over 100 years to build, but not long to succumb to fire. I'm in Paris atm on an Easter break with family. Tragic news. Can see the smoke from our hotel 2km away. Devastating, I’m the least religious person you will ever meet, but I love the architecture of these old churches, I am just amazed at how people in the 13th century constructed such magnificent buildings. I also love Paris, this is a huge disaster for the people of the City, as well as sad news for the rest of us. BBC are saying that the next ninety minutes are critical. Sadly the rose window has been destroyed and one of the bell towers is now alight. Looking at the footage I really can`t see how anything can be saved. For those of us who love architecture and history this is a very sad day. That’s pretty much my exact thought. Amazing really that it survived the French Revolution(s) and two World Wars only to now burn down in what appears to be an accident. Truly tragic. What a shocker. I must admit to having a hunch that something awful might happen to it one day though. Any news of 'the bells, the bells' yet? Looks like the fire brigades have done a heck of a job to save as much as they have - I was expecting to wake up to see half a shell of a building. amazing how often this type of things happen, the number of fires that destroy historical buildings whilst going through renovations is appalling. Superb effort by the FF. 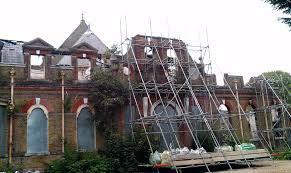 Hopefully in time it can be restored to how it was. I'm popping down to have a gander at the scene today. Feels weird to be in the area of such momentous news. My sister flew to New York for a short break on the day before 9/11. Maybe my family should just refrain from taking short holidays abroad. Over in Cardiff at moment Whitchurch Hospital which is nearly all Grade 2 listed is sat unguarded. Easter Holidays.. tick tock.. just waiting for the enviable. Can you please let us all know where and when you and your family holiday in future? The news is very sad for Paris , France and the world in general because this edifice belongs to all humanity. Fortunately there were no serious casualties , the two towers are intact and the building, though damaged , is still standing. There is some damage to certain works of art but many objects and paintings were saved . The firefighters deserve a huge ‘ thank you ‘ for their bravery and professionalism in extinguishing the fire and reducing the potential destruction. They are heroes and risk their lives to protect us and our belongings on a daily basis . The cathedral will have lots of money thrown at it to restore it to its former glory so if any of you feel like making a donation how about giving it to the fire services instead ? Absolutely this. The Catholic Church are one of the worlds richest organisations. They can afford the rebuild costs. Donating to the fire service would be a great way to support them for their tremendous efforts. Thankfully and amazingly the magnificent organ and pipes appear to have survived as well as did the priceless 'rose' windows and other treasures. Bloody miracle when you look at the raging inferno it suffered. Yesterdays events reminded me of this original Hunchback of Notre Dame film..
Just CONFIRMED by French heritage director, only ONE item of architecture inside the building has been damaged. The high alter (which was built in 1989) was damaged when the cathedral spier collapsed. The cathedral (as with all churches in France) is actually owned by the state. I`m not sure why, perhaps it`s because they are a particularly avowed secular country - no symbols of religion allowed in schools and so on. I only found this out in an interview on 5live this morning and it surprised me. I think the French Revolution resulted in the state ownership of churches and cathedrals. They threw out the Kings and the Church, although they invited both back several times so I am not sure when exactly Notre Dame officially became French property. In August 1789, the State cancelled the taxing power of the Church. The issue of church property became central to the policies of the new revolutionary government. Declaring that all church property in France belonged to the nation, confiscations were ordered and church properties were sold at public auction. In July 1790, the National Constituent Assembly published the Civil Constitution of the Clergy that stripped clerics of their special rights — the clergy were to be made employees of the state, elected by their parish or bishopric, and the number of bishoprics was to be reduced — and required all priests and bishops to swear an oath of fidelity to the new order or face dismissal, deportation or death. It’s always too soon for this. There was no chance of a short circuit to the electrical installation because it was changed not so long ago. That there are special monitors( which record the intake of oxygen I believe) and are early detectors of a possible fire outbreak. That there are two guards present all the time to watch over the building. He explained that old oak is very difficult to burn and he’s very surprised by the speed that the fire took hold . He doesn’t want to advance any theories but is surprised how quickly the fire was called an ‘ accident ‘. With the greatest respect to him, he could easily have been asuperb caretaker without needing to be an expert on how fire spreads. As we saw with Grenfell, fire is an unpredictable thing and often people do not notice or anticipate the weak links that cause a fire to spread. The fact there are always guards on site could be a contributory factor in why they have been so quick to conclude it was an accident. It may be they already have the information required to rule out the possibility of a deliberate act. Sadly, as others have said, periods of renovations often increase the chance of fire risks. The author Ken Follett has said much the same thing. Apparently his book 'Pillars of Earth' dealt with the building of cathedrals in the Middle Ages, and fire therein, although I have not read it. 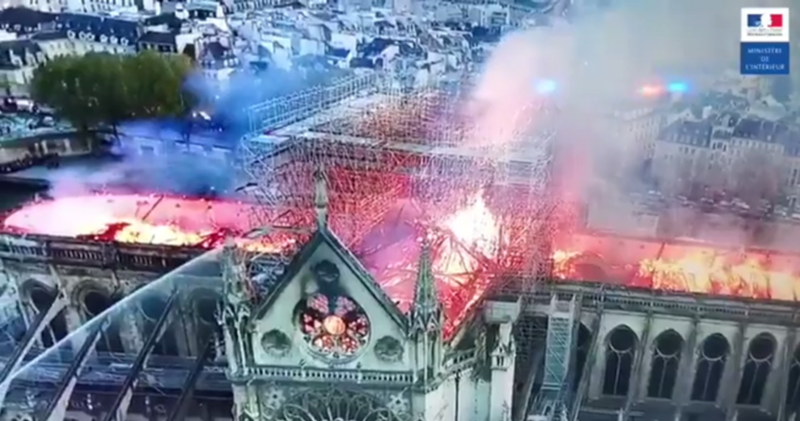 There has been a spate of such incidents in France this year and recently, mid-March, a fire in the second largest church in Paris, St. Sulpice (used in the Da Vinci code film) which investigators have said was definitely started deliberately. A half of all detectives in Paris are now working on the case according to the Press but it would come as no surprise if there were to be a cover-up if foul play discovered, especially if caused by 'the Usual Suspects'. You only have to study the sequencing of the pictures of the fire to see that the theory that the intensity of the blaze was caused by the spire falling through the roof into the nave is completely false. .......especially if caused by 'the Usual Suspects'. You only have to study the sequencing of the pictures of the fire to see that the theory that the intensity of the blaze was caused by the spire falling through the roof into the nave is completely false. Who are "the usual suspects" for causing fires in French churches? No offence but are you an expert in fire and how it spreads or just going on some "theory"? Have you looked at the pictures in sequence? There was already an intense fire in the roof area well before the spire fell. Of course I'm no expert, I doubt that many of the people on here commenting on any number of topics are experts in the topics on which they comment. Looking at the evidence as I see it, however, I see no reason to disagree with Ken Follett whom I think can be regarded as an expert on these matters. If foul play were to be suspected and if, a big 'if', the findings were to be made public then fingers would obviously be pointed at Islamic extremism. They do after all have a history of destroying religious monuments of which they disapprove, the giant Buddhas of Bamyan in Afghanistan and the temple of Baal at Palmyra for instance. Amazingly the Rose Windows have survived the blaze. Was waiting for the conspiracy theorists to pop up. 1 ) The fire at Ste Sulpice was quite small, did limited damage, and was started by a pile of clothes belonging to one of the homeless people who live in its porch being torched. The predominant theory is that it arose from a dispute between the homeless or some git attacking the vulnerable. I very much doubt half of Paris's police force is working on it. 2 ) Jihadists are not slow at coming forward to "claim" their actions. Nothing here. 3 ) Old oak burns very well, as the York Minster fire proved. 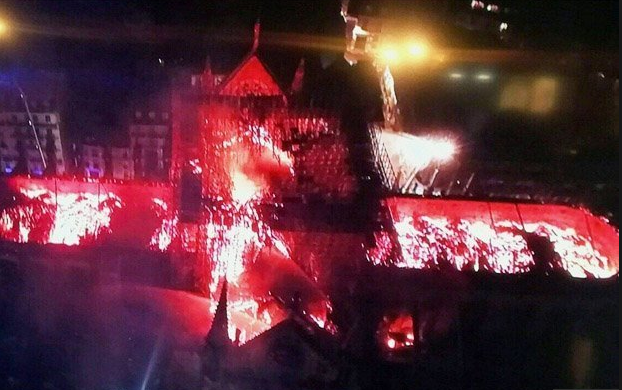 4) If the French government suspected Notre Dame was arson, it would have no reason to cover the cause up. It was quick enough to identify Sainte-Sulpice as arson. 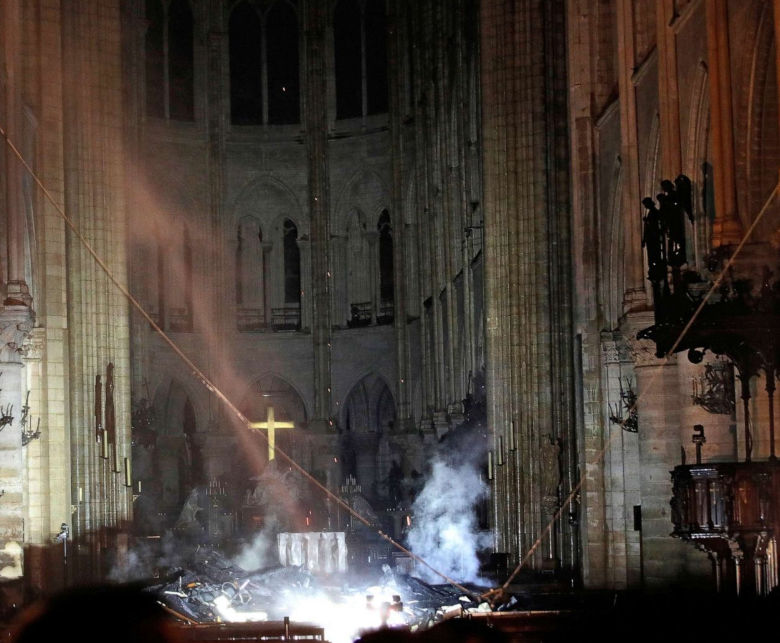 At present we don't know what started the Notre-Dame blaze, but the presence of widespread building work and the acceleration afforded a fire by the presence of scaffolding boards over much of the Cathedral exterior has to be the main line of inquiry. 5 ) The Express and the Sun have repeated fake news claims from tinfoil hat website sources that 10 French churches have been thus attacked. in fact, a small fire was started in one church in February by ********* who left Satanic symbols in the church. Two other church's suffered similar vandalism this year, but without fires. None were in Paris or areas of high Muslim population and it is probably just kids twatting about. France has more churches than the UK and I don't see a spike in vandalism there any more than over here. We've twice had our parish church window smashed in the last two years by some numbnut. The culprit in rural Somerset is highly unlikely to be Muslim, nor are Muslims likely to draw Satanic symbols in churches in France. It’s getting very “jet fuel can’t melt steel beams” in here.